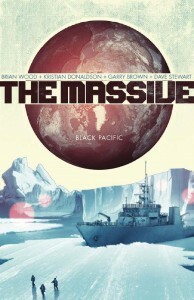 The Massive tells the story of the Ninth Wave conservationist force ship The Kapital as its crew tries to survive in a post-apocalyptic world and find their missing sister-ship, The Massive. The Kapital’s crew is an odd group of misfits and environmentalists; the captain, Callum Israel, previously worked for a Blackwater-style outfit until he grew tired of killing and rededicated his life to pacifism and environmentalism. Along for the ride is another former mercenary, Mag Nagendra, who is still more than willing to use violence to protect the ship and its crew, and a mysterious woman named Mary who may not be what or who she seems. As for the apocalypse, it was more of a gradual world-wide collapse than anything more cut-and-dried. Water levels have risen, half-burying cities around the world. Huge parts of America lost power and never got it back. A series of environmental disasters crippled world commerce and decimated local populations. All of it has added up to a world where The Kapital spends its time searching for supplies, bartering with criminals and running from pirates. In fact, there is very little plot to this first volume of The Massive that doesn’t concern The Kapital’s efforts to resupply. We are given small glimpses of back-story as well as hints of supernatural events later in the book, but for the most part the story focuses on the dry minutia of survival. Scenes of fighting off pirates and searching for supplies alternate with flashbacks explaining the disasters that added up to a sort of slow, creeping end of the world. The introduction to the book emphasizes that life goes on after a disaster, and explains that part of the idea behind The Massive’s story was to talk about a different kind of apocalypse, where people just keep living in spite of the world falling apart around them. It’s an interesting concept, but unfortunately the result feels more like an environmentalist lecture than a compelling story. Character development is limited, and what plot there is concerns itself with fairly mundane occurrences. There’s a good amount of discussion about the missing ship, The Massive, which clearly has some significance to the overall storyline, but I didn’t get a sense of where the series was going from the first volume. It felt like the author spent most of his time establishing a number of plausible environmental disasters, but neglected to offer interesting characters or a compelling storyline. The one strong point is the art, which favors striking realism throughout. Unfortunately, however, that isn’t enough for me to recommend this book, which I ultimately found dry and uninteresting.